Feds bust Iraqi-Mexican drug ring in Calif.
SAN DIEGO - Federal officials said Thursday they've busted a drug trafficking ring involving Mexico's most powerful cartel and members of an Iraqi immigrant community in the U.S. who were caught selling illegal drugs, assault rifles, grenades and homemade explosives. 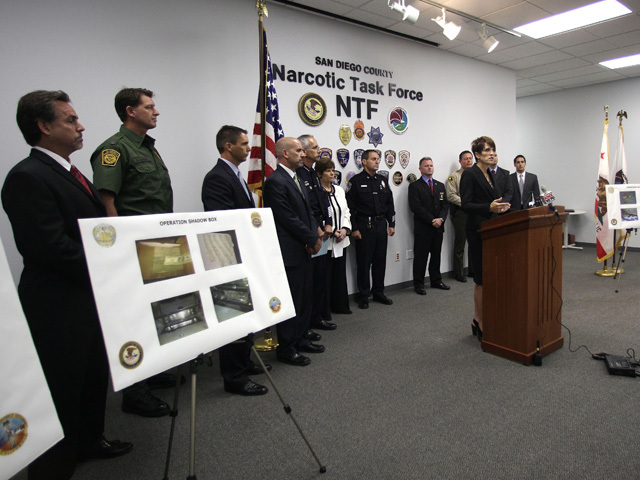 About 60 people from the Iraqi community were arrested after a six-month investigation carried out by the Drug Enforcement Administration and police in the city of El Cajon, a working-class city east of San Diego. Many of the suspects are Iraqi Chaldeans  Christians who fled their homeland amid threats from al Qaeda and other extremists. Police say at least some of those arrested are suspected of being affiliated with the Chaldean Organized Crime Syndicate, an Iraqi gang based in Detroit. Authorities say the suspects were working out of an Iraqi social club in El Cajon and shipping drugs supplied by Mexico's powerful Sinaloa cartel to Detroit, home to the largest Chaldean population in the United States, according to the federal indictment unsealed Thursday. El Cajon has the second largest Chaldean population. Officials were tipped off after neighbors and even some of the club members' spouses complained for years about the establishment's criminal activity, which has included attempted murder, sales of meth and marijuana, gambling and illegal firearms sales. Authorities seized 18 pounds of methamphetamine, narcotics, cocaine and other drugs; more than 3,500 pounds of marijuana; $630,000 in cash; four IEDs; and more than 30 guns, including assault rifles. In April, a DEA undercover operative was shown a hand grenade by one of the Iraqis and was told additional grenades were available from a Mexican military source. Officials believe the weapons and explosives were meant to be sold locally and there were no indications the group was supplying Mexico's most violent cartel with weapons for use in that country's drug war, which has claimed at least 35,000 lives. William R. Sherman, acting special agent in charge in the DEA's San Diego division, said the ring was going to sell a portion of the 3,500 pounds of marijuana, believed to belong to the Sinaloa cartel led by Joaquin "El Chapo" Guzman, who has become one of the world's richest and most-wanted men since he escaped from a Mexican prison 10 years ago. Officials say the Chaldean syndicate has historical ties to the Sinaloa cartel but they said they did not know the origins of those ties. Over the past two decades, Mexican migrant smugglers helped many of the Chaldeans reach the United States. The descendants of the ancient inhabitants of Mesopotamia  what is now Iraq  fled their homeland to escape persecution for their Christianity. Hundreds passed through Tijuana on their way to California. About half of the 60 arrested face federal charges and half face state charges. Some are also illegal immigrants but officials declined to say whether they will be deported. Four indictments were unsealed Thursday charging nine people with federal narcotics and weapons trafficking charges and the unlawful possession of various firearms and explosives. One of the suspects, Nofel Noel Suleyman, was also charged with engaging in a continuing criminal enterprise, which carries a mandatory minimum sentence of 20 years in prison. Officials said the investigation is ongoing and there could be more arrests. They declined to go into specifics about the ring's business. The club had armed guards at high-stakes card games and its managers were aware of the criminal activity, demanding a cut of the money, according to authorities. The establishment's troubles go back to 1998 when police seized illegal slot machines. Four years ago, authorities identified it as a hot spot for Iraqi drug deals and two years later started investigating it for selling weapons and explosives. Sinaloa has grown bloodier and more powerful in recent years, controlling cocaine trafficking on the Mexican border with California, while expanding eastward to the corridor between Sonora and Arizona and waging a fierce battle for Chihuahua state bordering Texas. That war made the border city of Ciudad Juarez one of the world's most dangerous cities. In October 2010, Mexico made its largest marijuana bust  134 tons  in Tijuana and said markings on the packages linked the haul to El Chapo, showing that he was also running drugs smoothly through a city once controlled by his archrivals, the Arrellano Felix gang. Christians make up more than a third of the 53,700 Iraqis resettled in the United States since 2007, according to State Department statistics.